As I mentioned several times beforehand (I think I did it mostly in German posts), I’m in the middle of writing my bachelor thesis. the thesis covers the whole product design and development lifecycle of a mobile CRM- and Commerce-Application for B2B-clients from the fashion industry. The target customers are clothing labels or the licence owners of the brands with the company’s sales staff as the intended users. As the fashion industry is inherently “into” design and aesthetic, the design of the application is very important. The thesis also contains wireframes, mockups and a working prototype of an iOS application (which I can’t write more about at the moment as it’s all under a NDA). had problems finding specific literature. discovered that other people were also looking for it. discovered that there are several (academic) design disciplines envolved or at least meddling with the design of a smartphone UI and that the terms and names were not always clear as they were often used in exchange of each other. So, here is my blogpost (sorry for it being rather lengthy) about finding literature. I discovered that I also did not know much about designing as a process, so I also got myself some literature on this topics as well, so I’ll start with those first. This book is a concise introduction in what designing a product and the whole steps that together form the whole design process. He discusses all important topics from research, various design techniques and methods as well as topics such as prototyping and the whole project management that comes with it. 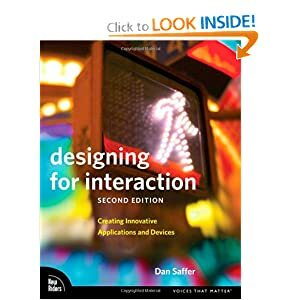 So maybe the only problem was that I think that the title could be a bit more focused about what the book is about: the (interaction) design process. It’s a good book. It’s not too lengthy (it’s around 250 pages) so you can devour it on one rainy weekend and you get a pretty good idea what the design process is about and what it should/can be like. I’d recommend it for design beginners as most people with some basic knowledge might already know most of the stuff in it but as book about the fundamentals, I can definitely say that it’s worth the money. Goodwin expores them into great detail and with many examples and pictures. This book is, by all means, a reference and a guide for the whole design process with a focus on goal-oriented (user-centered) design. 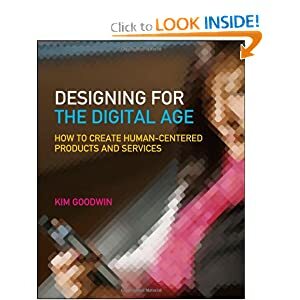 This es no surprise as Kim Goodwin is VP of Cooper Design and her book can be considered an addition to the well-known “about face”-books by Alan Cooper. This book requires the reader to really work with the book. The presented information is very detailed and I won’t call it a light read as it is a very heavy book (literally!). In addition to the two books that both focus more on the design process, this very new book (you can get it pretty quickly directly at PragProg) may not be as detailed as both books above, but it’s avery easy to read, nail-it-down book about usability. It covers some theory behint UX and UI design but stays very focused on the task of designing for great usability. The books covers topics that are interesting for developers as well as designers or project managers, so that alone should qualify it as a “must buy”. 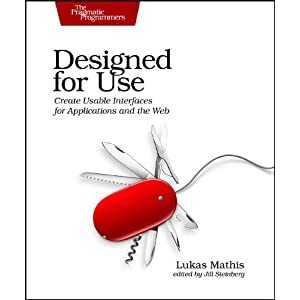 Though some of the topics can not be explained in every detail, the author provides references and further reading information so it is a great ressource for state of the art UI and UX design. 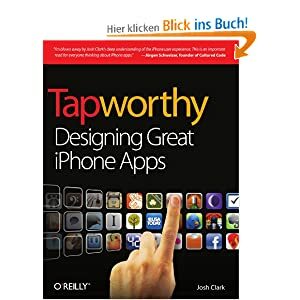 As it also covers issues relating the to designing smartphone applications, it is maybe my favorite read one the three books that I have mentioned until now. It does not focus on the theory but provides a hands-on approach. In consequence, it’s a great help in every-day business so if you look on a ressource that helps you do transform the idea into an app, the book is perfect for you. If you are looking for a theoretical reference, this book won’t help you so it will depend on what you are looking for. Now, let’s move to the books about designing (smartphone) UIs. As the previous books didn’t contain information on general screen- and interfacedesign best practices, I looked for a book that could serve as some kind of general Interfacedesign reference. Unfortunately, I did not find any english reference, but found a very good book in German. I’ll just provide you with some key information. 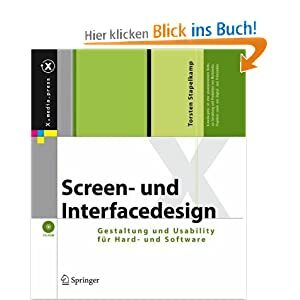 This book serves as a complete reference for all things related on screen- and interfacedesign. Beginning with fundamental stuff about measuring and using color and how it is perceived, the author moves on to typography, various chapters on layouting and the different design disciplines that are involved on to researching potential users. The whole book (which I, unfortunately, only got as an ebook from my university) features many examples and references and can also be a source of inspiration to the reader. Every topic is explained in great detail and with a quick-read summary at the end of each chapter. It’s very useful to learn about UI design in general so I highly recommend it if you want to get some knowledge on the different things you have to keep in mind when actually designing a UI. 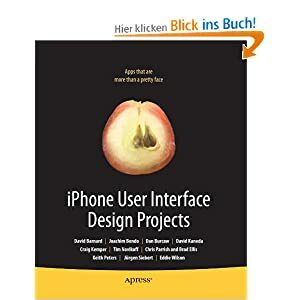 This books appears to be one (or maybe THE) reference about designing smartphone UIs (of course it’s about the iPhone but it can also be used as an inspiration for the design of applications on other plattforms). It kind of states the most things obvious. Most are overlooked. Read it. It has been a great help and sums up many things that successful and beautiful applications do to have a great UI and are a pleasure to use. Again: Read it. It’s sort of a UI design pattern book for iPhone UIs. The only thing missing: references. This book is not so much a reference but serves as a kind of inspiration during the UI development process. It basically consists of various essays and interviews of developers (of well known applications) that write and talk about problems they had to overcome during their projects and how they solved them. I read it occasionally to get some inspiration and I really like it. I read a lot of UI guidelines, namely those for android, iOS and windows phone 7. They are great ressources and very helpful, so you should definitely read them. 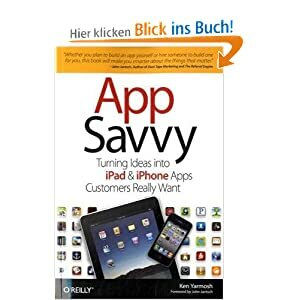 Books on smartphone UI in general or for non iOS-platforms. “Strangely”, most ressources are dealing iOS-centric. This are the books that I used for my thesis and for the development of the prototype that I’m currently working on. Eventually this will lead to a product and I can write some stuff about it. I hope that this post is of some help to others who can save some time out of my experience. I’d like to get as much feedback as possible, so leave a comment. If you have any further suggestions and, feel free to post them so that I can add them to my reading list. I forgot to mention some stuff. There are a lot of great online magazines and blogs on UIs and UX in general though I still think that there are not enough ones on mobile UI and UX, so keep me posted if you have suggestions.